A pretty little 1927 one off yacht is one of the first entries for the 12th Cowes Classics Week. Chough, owned by Alex Kathrin Vowinckel, typifies the spirit of the event which, despite being a draw for vintage yachts and designs from all over the UK and beyond, is hotly contested on the race course. Chough herself is no slacker following an absence from the event she will be seeking to reclaim her class title that she last held onto three years ago and even maybe her Concours d’Elegance Award which she has previous won at Cowes Classics Week. Chough’s entry is one of a steady flow of yachts whose numbers are likely to reach in excess of 180 if previous years are anything to go by. Preparation for the event is now officially under way. With the launch last week of the new 2019 website, competitors can now find information and enter the event. www.cowesclassicsweek.org. Racing takes place from 29th July to 2nd August. Cowes Classics Week has grown strongly since its inaugural regatta whose fleet meets the qualification of being built to designs drawn up before 1979 or in the spirit of tradition. Many truly classic yachts will be coming back once again to compete in a week which offers thrilling Solent race courses and evening entertainment. The newly formed classic Swan Division is already taking shape with the entry of Stephen Brookson’s Kiswala. Meanwhile the XOD class entries are starting to arrive in a class that is likely to number more than 50 entries. 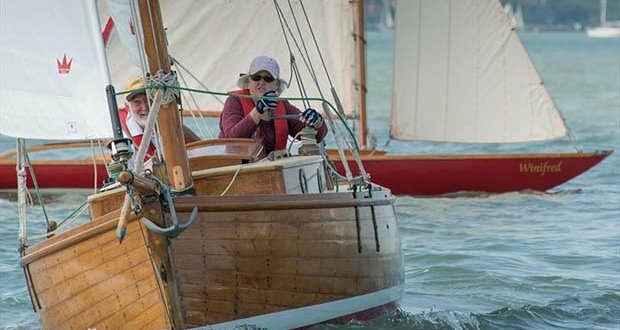 For the classes, which include classic cruisers, XODs, Darings, Dragons, Solent Sunbeams, Swallows, metre yachts, Old Gaffers and other classic keelboat designs, the week will once again provide thrilling Solent race courses and evening entertainment. Red Funnel is, for the first time, the Signature Sponsor of the Event. The afternoon Winkworth Tea and Cakes are legendary, held after racing each afternoon at the organising club, the Royal London Yacht Club. Cowes Corinthian YC and the Island Sailing Club are opening their doors for social events as well, while the RORC and the Royal Thames YC are helping on the water. Log on now at www.cowesclassicsweek.org to see the Notice of Race, planned events and entry form.